Blennerhassett Island Bridge opened to traffic June 13, 2008. The bridge is a Network Arch Bridge constructed at a cost of $120 million over the Ohio River between Belpre Township, Washington County, Ohio and Washington, West Virginia in the United States. Construction of the bridge was completed by the Walsh Construction Company of Chicago. 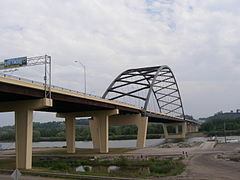 The completion of the span, which carries U.S. Route 50, completed Corridor D between Interstate 275 east of Cincinnati to Interstate 79 at Clarksburg, West Virginia. Corridor D is a part of the Appalachian Development Highway System. The bridge travels over the Ohio River and the historic Blennerhassett Island. The bridge is wholly owned by WVDOT while only the approach ramps on the Ohio side are owned by ODOT . ^ Parkersburg News. "Bridge Nears Completion". Archived from the original on 2008-05-13. Retrieved 2008-04-16. ^ a b GoBridges.com. "Innovative tied-arch steel bridge to span Ohio River". Archived from the original on October 7, 2007. Retrieved 2015-12-08. Wikimedia Commons has media related to Blennerhassett Island Bridge. This article about a bridge in West Virginia is a stub. You can help Wikipedia by expanding it. This page was last edited on 13 February 2019, at 17:07 (UTC).